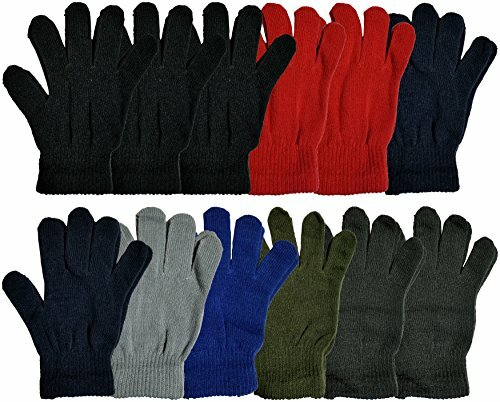 ONE SIZE FITS ALL: Keep your hands warmer this winter with these solid colored magic gloves for men and women. Each pack includes 12 pairs of knit gloves making them ideal for sharing with the family, loved ones, and friends. WARM, COZY, COMFY: Features a ribbed cuff to help trap body heat close to the hands and prevents cold air from entering. A comfort knit ensures that your hands are warm, cozy, and comfortable. Provides mobility for everyday activities including driving. WINTER GLOVES: Brave the cold weather this coming winter making the commute to work, running, exercising, hiking, and other activities much more pleasant. The gloves feature a softer texture for more comfort. Keeps your fingers and palms toasty. STRETCHY MAGIC GLOVES: Magic gloves offer more stretch than your typical pair of gloves, allowing it to conform to your hands and fit a wide range of hand sizes. These casual gloves are perfect to match with any outfit and different neutral colorways that keep you look dapper or chic. 12 PAIR BULK PACK: Made with a soft acrylic blend for comfort and warmth. One size fits most men and ladies. Each bulk pack includes 12 pairs of gloves. The multipack includes a dozen pairs, making it the perfect gift for a loved one, friend, family member, or for yourself. Made with soft and warm acrylic.